Bringing a good portion of that ‘circus’ to life is Pam Anderson, the manager at Architecture Art in Aliso Viejo, California. Comic-Con as an organization has been arranging huge ads for big studios and networks, Anderson said, but last year's convention seemed to be a turning point in movie and video game publicity. 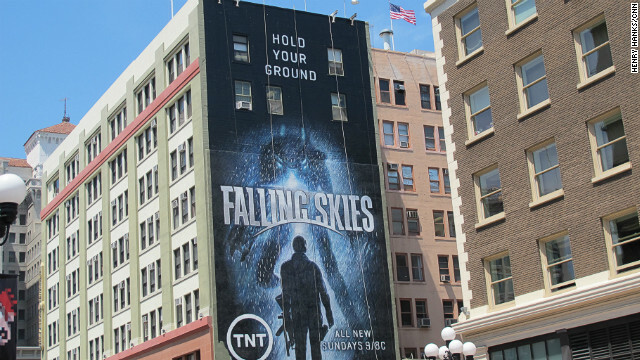 This year, among Anderson's many projects is a massive, hand-painted mural showing a stormy scene from "Falling Skies" (which airs on TNT, a Time Warner company like CNN) on the side of a building. She quickly realized that a two-dimensional banner wouldn't be enough. "When the public can walk by and see our artists literally painting a mural of this size, it’s a fascinating thing, an event in and of itself," she said. Anderson pointed out this kind of work can take up to two weeks to complete, as opposed to a printed banner's half-day installation process. "Can you imagine painting a storm, every little drop of rain?" she said. 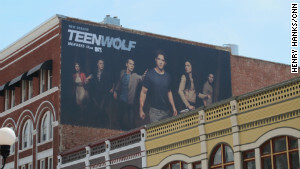 Even when banners are used, like with an ad for MTV's "Teen Wolf" on the side of the historic Keating Hotel, precision is key. Small details in mind, Anderson explained how the image of a knife is just visible above a building in the foreground. Comic-Con displays are about "shock and awe," Anderson said. "When you see a 20-story high Spider-Man or a Transformer, it really transforms you," she said. Dan Beer, one of Anderson's clients in 2011, personally saw the power of Comic-Con marketing when he worked on what appeared to be a three-dimensional painting for the video game company Ubisoft. “It’s a pretty marketing and ad-savvy audience that goes [to Comic-Con], and they’re used to being hit with messages day in and day out. We wanted to be sure we stood out with this message." Beer compared the marketing at the event to the highly valuable 30-second ads during the Super Bowl. "There’s a lot of time and energy spent in refining the perfect message and creating work that’s going to impact this audience," he said. "Visitors here are well-versed in what games are coming out. They know when games will be released and already have an opinion formed of those games. We wanted to reach out with this game so this influential group can go back and share the word with their communities." The overwhelming promotional imagery is endemic of what seems to be the bigger-is-better mentality at Comic-Con, but what does it say about the conversation that these companies are trying to have with fans? "We have this motto, ‘Go big or go home … and don’t charge,'" said Lisa Gregorian, chief marketing officer for Warner Bros. Television (also a Time Warner company). Warner had a reputation for handing out free swag bags at The Con, but three years ago, they asked to sponsor Comic-Con's bag. The rest is history. Now Warner TV imagery appears not only on the bags - which every attendee receives - but on many San Diego hotel keycards as well. Comic-Con is truly fan-centric, Gregorian said. If you're an entertainment company, "You’re relying on the fans to carry the load of the social media," she said. But those companies are aware that the sea of publicity images are part of the bigger picture at Comic-Con, involving booths, panels, swag and signings. “They put it all out there and hope for a good response. If they can get the buzz that [a ‘Twilight’ or ‘Iron Man’] brings, that’s huge for them,” Barrett said. “It’s a real gamble for these studios." Are you at Comic-Con? Share your photos of imagery like this and other sights and sounds of the convention on iReport. Enjoy lower-octane flatulence. Individuals don't want over-priced high-octane fuel for auto's: weight reduction, they don't really greatly improve all of our cars' fuel economy neither improve their general. By undesirable, they are able to perhaps even make the build-up most typically associated with pessimistic and also carbon uric acid inside your electric motor (these are not burned off so in the form of all the way down octane powers). Needless to say your car exclusively calls for top quality if you would like (you can even examine that user guide do you ever not sure recommended energy resource for your nissan zx turbo), pass these types of yet complete via professional moreover less expensive energy.